Koshi Blend is ACC’s proprietary blend of the original Koshihikari variety from Japan and similar varieties developed in California. Without sacrificing its premium, short grain qualities, Koshi Blend can service the more price conscious user seeking a premium short grain product. The firm, short and sticky grains are the preferable consistency for most traditional Japanese dishes, notably sushi. Its grains are known for holding their firmness for long periods of time. 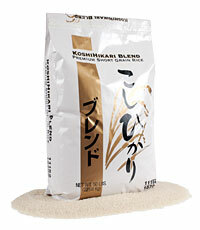 Koshi Blend is also perfect for creamy rice dishes such as risotto and rice pudding. ACC is widely recognized as the largest producer of high quality short grain rice in the United States.